Henri Fantin-Latour was born in Grenoble, Isère on January 14, 1836. Fantin-Latour was a lithographer and painter who was popularly known for his group portraits and flower paintings. His full birth name was Ignace Henri Jean Théodore Fantin-Latour. He was tutored in drawing early as his father was a pastel artist. In 1850 when he was 14 years old, Latour entered the Ecole de Dessin, where his teacher was Horace Lecoq de Boisbaudran, a French artist who was also a teacher of Auguste Rodin. Lecoq de Boisbaudran emphasized memorization in his teaching, so that his students would be able to discover their own expressive language, visually speaking. From 1854 Fantin-Latour was studying at the École des Beaux-Arts in Paris and worked in the studio of Gustave Courbet. He spent much of his time at the Musée du Louvre, copying the works created by the old masters. It was during his frequent trips to the Louvre that he met Edgar Degas and Berthe Morisot. Likewise he was able to befriend several other artists, such as Édouard Manet and James Whistler, and would be associated with the other Impressionist painters. However, Fantin-Latour’s paintings were styled conservatively, more in the tradition of the realistic style used by the masters of old. His passion for the works of Schumann, Berlioz and Wagner were depicted in most of his lithographs and other paintings. The style he used for these paintings and lithographs strongly influenced other painters like Odilon Redon of the Post-Impressionist and Symbolist movements. Thanks to James Whistler, Fantin-Latour became known in Britain in 1859, introducing the French artist’s beautiful paintings of flowers that were being overlooked in France. 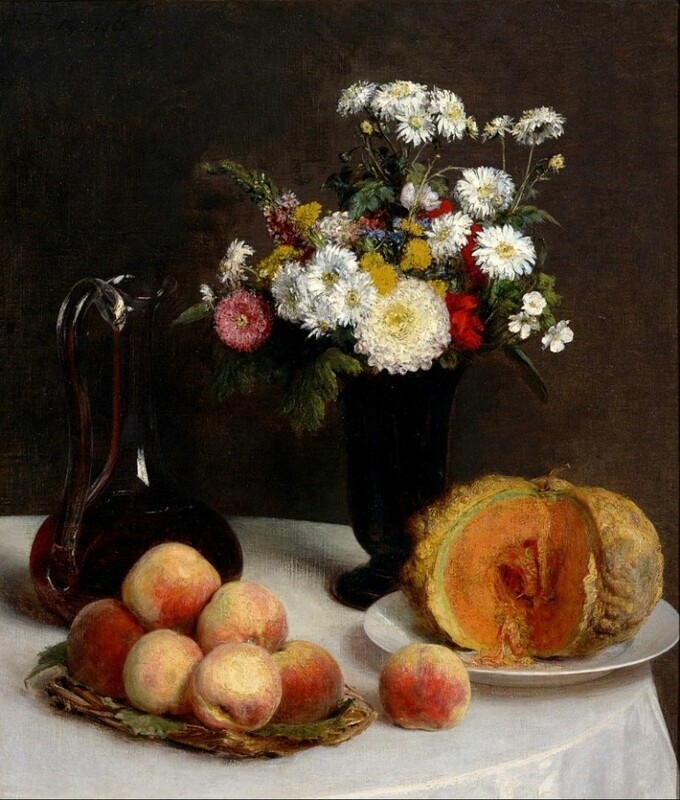 He actively painted his still lifes with flowers from 1864 and exhibited at the Royal Academy. Many galleries in Britain carry several of his flower paintings, as well as his portraits. Aside from his very lovely and realistic paintings, Fantin-Latour drew inspiration from the music of many famous classical composers to create imaginative lithographs. While still in school and frequenting the Louvre to copy the works of the famous masters, Fantin-Latour became friends with many young artists who joined the Impressionist movement later. Some of his artist friends included Camille Corot, Gustave Courbet, Eugène Delacroix and Jean-Auguste-Dominique Ingres. He would have some of his paintings exhibited in the Paris Salon in 1861 and subsequent years. Two years later he exhibited with other Impressionists in the Salon des Refuses, such as James Whistler, Édouard Manet, landscape artist Henri-Joseph Harpignies and Alphonse Legros. 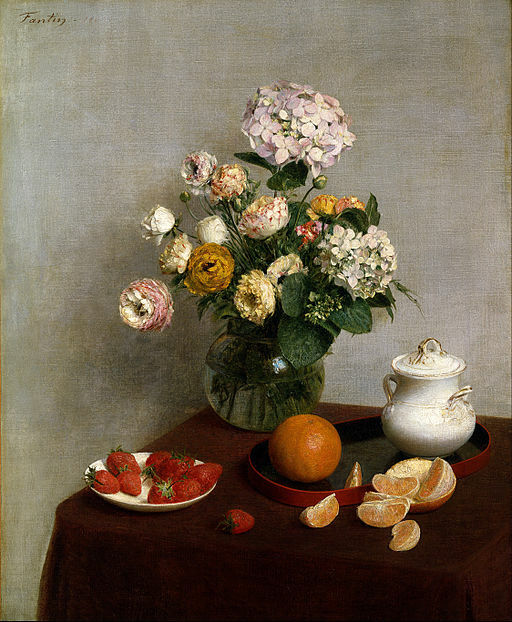 Fantin-Latour’s paintings of flowers were of exceptional beauty and were considered the perfect examples of paintings with its particular subject matter. They formed a major and famous part of most of his works found in England. While James McNeill Whistler introduced him to the art circle in England, he also had help from Sir John Everett Millais, who introduced him to Edwin Edwards, an affluent amateur engraver who provided support to Fantin-Latour by buying his flower still lifes for many years. In the latter part of his life, Fantin-Latour devoted much of his time to creating lithographs. Earlier on, most printers refused to execute his lithographic works because they were deemed too revolutionary with their strong dark and light contrasts. He started exhibiting his lithographs in the Paris Salon in 1862. Some of these were delicate portraits while others showed imaginative and elusive subjects, depicting the music of several composers, including Wagner, Brahms and Berlioz. Examples of his beautiful lithographs could be seen in the Louvre, the British Museum and in galleries in Dresden. Those in the Louvre were donated by his widow.